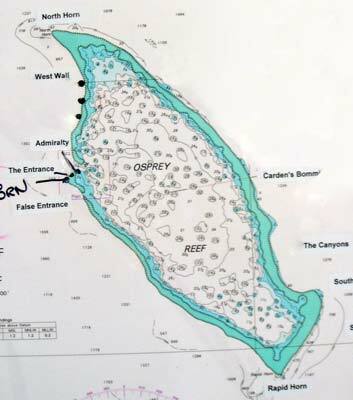 This is the very northern point of Osprey Reef. The GPS Reading is S13° 48' 05.2" E146° 32' 45.7" using WGS84 as datum. It is approximately 320 kilometres from Port Douglas. The location obviously gets its name from the shape of the reef which from the air looks like a horn on a unicornfish or similar. There are two sections of reef to follow. One is the western side and the other is the northern side. 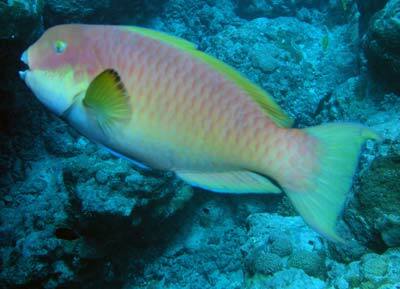 Where the two main sections of the reef join, they do not meet in a < shape but more in a blunt [ shape. That is, there is a section of reef between the reef coming from the south (the one facing west) and the reef coming from the east (the north and east facing one) are joined by a short section that runs for perhaps 50 metres. 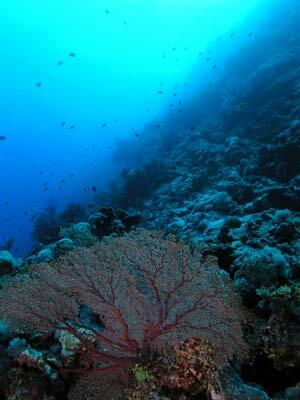 Deeper, the reef goes to a point. The depth there is about 35 to 40 metres. There is a mooring on a bommie in about 12 metres of water at the above GPS reading. The current (when it is running) here mainly comes from the south and east. This means that you will have to swim into the current no matter which way you pick to go unless you get a rare day without a current (from one or both directions). On the days I dived here there was no current from the south but a slight current from the east. The best dive is along the western wall to the south. 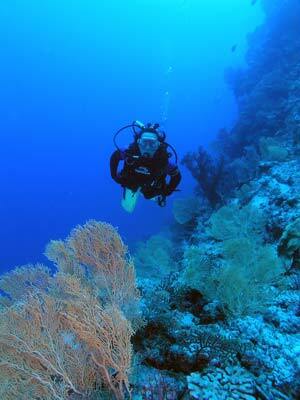 This dive is normally done by dropping divers off about 200 metres to the south of the North Horn mooring. The boat goes back to the mooring and you go one way to the mooring. As the currents here (if they exist) nearly always run north, you will not encounter any problems. The boat will manouvre close to the main wall and drop off the divers in groups. As the visibility is always aroudn 40 metres or more, you will have no trouble seeing the bottom as you descend. Drop to 30 to 35 metres and head north. If there is no current, it is not a problem to swim the distance back to the mooring. As mentioned in the North Horn article, the gorgonias and soft corals along this wall are some of the best you will see anywhere. While they are not huge, there are quite large and certainly prolific. As you go, ascend slowly making sure you do not get into deco. 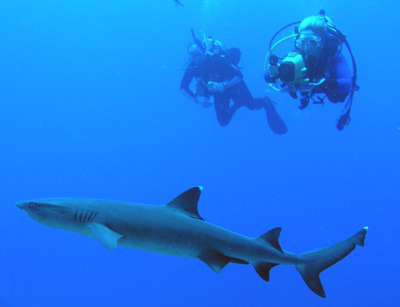 Look out for sharks (white-tipped mostly but also silver tip and grey whalers). With no current it will take about 20 minutes to get back to the corner. In a current it will obviouly be less. 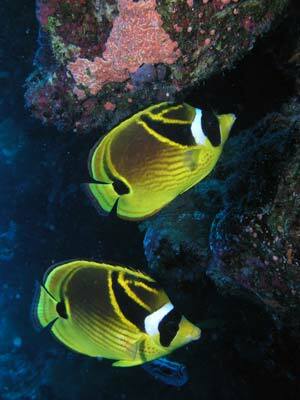 Back at the mooring, spend time on the bommie top and near the top of the main reef. 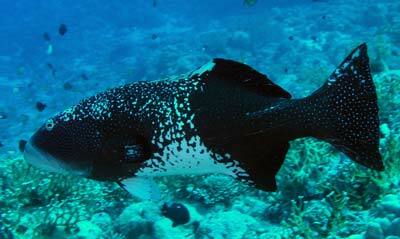 I have two other dive descriptions for this location, see North Horn and North Horn Shark Dive. Visibility here is nearly always at least 40 metres.